Kevin Emerson: HOLIDAY BOOK GIVEAWAY! Every time I publish a book, I get a box of author copies. I give some to friends, give some to schools, use some as coasters, but ultimately, they all end up in my office closet. I think these books would be much happier in classrooms and libraries! So in the spirit of the season, I'm giving away one set of SIGNED BOOKS each day for the next twelve days. Want to win some free books? YES YOU DO. You can win just by commenting on this page, or on the posts on Facebook and Instagram. I will pick ONE WINNER PER DAY FOR TWELVE DAYS. You only have to enter once. I'll keep you in the drawing the whole time. IF YOU ARE A STUDENT or the PARENT OF A STUDENT: Leave a comment telling me which book set you want for your class (or your students' class) and why, AND YES, YOU CAN READ THEM FIRST. Just promise you'll pass them along to your teacher or school librarian, 'kay? 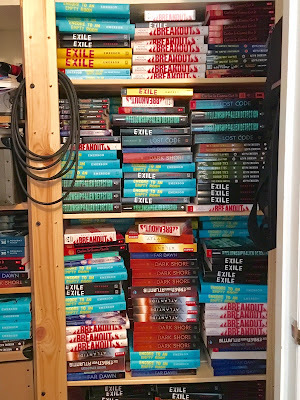 Set 1: The EXILE Series: Contemporary YA rock and roll trilogy, books #1 and #2, EXILE (yellow hardcover or black paperback) and ENCORE TO AN EMPTY ROOM (hardcover). (Book 3 comes out next summer!). Ideal for ages 13 and up. Set 2: The ATLANTEANS trilogy: upper middle grade or YA futuristic sci-fi action fantasy series (best for grades 6-8, or mature 5th grade readers). ARC copies available if you're interested. Set 3: BREAKOUT and CARLOS IS GONNA GET IT: The realistic, upper middle grade / middle school fiction collection. Ideal for grades 5-8, and book talks. Set 4: The OLIVER NOCTURNE series and THE FELLOWSHIP FOR ALIEN DETECTION: Middle grade supernatural and science fiction! Perfect for grades 4-8. Let me know what you want and I'll enter you to win! Can I enter on behalf of a teacher? My brother's mother-in-law teaches 4th grade, and Set #4 would be perfect for her classroom! Set #4 would be perfect for my 4th Grade classroom library. I have Realistic Fiction and Historical Fiction, but there is a massive abyss when it comes to Science Fiction and Fantasy. The adventuresome SciFi/Fantasy readers have threatened an interschooler revolt if their rations do not start including futuristic and fantastical elements. Hey Kristina, you won the first drawing! Please email me with a mailing address and also how you'd like me to sign the books. (email is on my contact page.) thanks! I would love to have either set 3 or set 4. I am a student entering. I think Set 2, The Atlantians, would be great for my highschool. Also, my librarian works so hard around the school and hardly ever gets recognized. I've nominated her multiple times for "staff member of the month", but to no avail. I think a pile of books would be a great thank you/ Christmas gift. Thanks so much, Kevin. I'm a huge fan. I am a teacher and would love set #1! Reasons: I met you at NCTE14 and got a copy of both books. However, they were so well-loved, neither made it back to my classroom! I would love to restock. Hi Jennifer! I just posted a video on Facebook and you're a contest winner! Please either contact me by email (on my contact page), or on Facebook, or give me an email and we'll connect about where to send the books and how to sign them. THANKS! I am entering I behalf of Cassie Cox, one of the most giving teachers out there. She would love set #1. I would love for her and her students to benefit from this awesome give away. Thank you, and Merry Christmas! Hi Gail, you won the first drawing! Please email me (address on my contact page) or message on Facebook with a mailing address and how you'd like me to sign the books. Thanks for entering! Set 4 - I want to expose my students to more Science Fiction. 93% of my students are free/reduced lunch so filling gaps in background knowledge by reading books from diverse genres is vital. I am a high school teacher who gives my kids time to read every day. Next semester I will teach a class for the alliterate students among us. Those who can read but don't. I would love to include the Exile series in my room. Rock and roll and reading! It can't get better than that! Hi. I would love to have set #2 for my classroom. I teach blind/visually impaired middle school students, and these would be a great addition to my library to read to the students after lunch. Thank you. I teach 6th grade and would love Set #3 for my classroom--really, I'd be happy with any of the sets. I teach in a high poverty school and stocking high quality texts for my students is important to me as many don't even have books at home to read. Thank you so much! Hi Trisha! I just posted Day 4-6 winners and you are one of them! Please send me a mailing address, either by email (on my contact page) or Facebook, or post it here. Thanks! Can I enter in any/all of the above sets? I am a librarian at a K-12 school with a very diverse population of students and a library which was previously ignored before I cam onto the scene. I'm starting to grow the library, so I would happily take any of the above books. I am the teen services librarian at Sammamish Library and we're fortunate to have you visiting our Youth Writing Club on December 8. While I have library copies of your books on display and available for checkout, I'd love to be able to give away some copies of your books (any set) that teens could add to their own personal libraries. Hey Alison! I just posted a video on Facebook and you're a contest winner! Please either contact me by email (on my contact page), or on Facebook, or give me an email and we'll connect about where to send the books and how to sign them. THANKS! Actually Alison we're already connected on email... forgot about that! I'll bring books wednesday! Is this an international giveaway? I am a high school English teacher from the Netherlands. My school has been re-using these uninteresting books from 10 years ago for the students to read. I would love to give them new books, but according to the board there is not enough money. I would love to win set 1 or 2 for my classroom so the students can enjoy reading for once. I would love to but the shipping costs are out of my budget. If I entered you and you won, could you maybe split the shipping with me via paypal? Yes! I'll definitely split with you if I win. Thank you for the chance! Love to have set one (rock and roll) for my twins school. They and their friends love to read. Hi! I just posted a video on Facebook and you're a contest winner! Please either contact me by email (on my contact page), or on Facebook, or give me an email and we'll connect about where to send the books and how to sign them. THANKS! this is so kind and generous of you! set two would be perfect for my sixth graders readers. 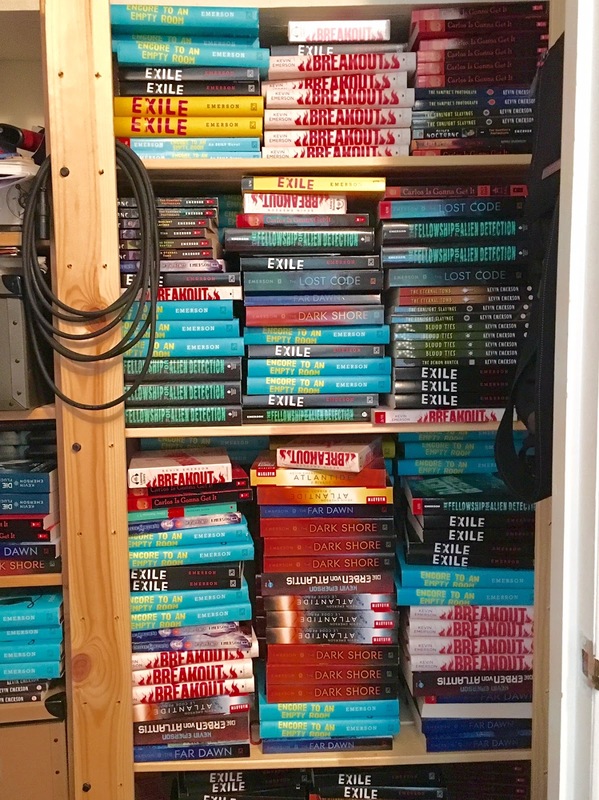 I am a home schooling mother of two and The EXILE series would be perfect for my 5th grader. She is always looking for something different and exciting. Music is a core part of our lives and I find it fascinating you have incorporated it into a trilogy. I think she will as well and my 3rd grader when he comes of age. Thank you for considering us. Thanks for doing this. I am a grade seven teacher. I think that book set #1 would be a great addition to my classroom library. I am a high school English teacher, and I work with resistant readers who love YA books. I would like to enter for the drawing for Set#1. Thanks, and Happy Holidays! I'm a middle school librarian and I know my students would love your Atlanteans Trilogy (set 2) because they cannot get enough of dystopian adventures like the Hunger Games. I never have enough read-alikes to check out to them and I do not have this series in my library. I really enjoyed Breakout (my first introduction to your writing) and look forward to reading more of your books. Even if I don't win, thanks for promoting reading by giving out your books. It makes a difference. WOW! What an AMAZING idea! As a middle school ELA teacher in the inner city, I can't tell you how touching it is when my students see a NEW book! My kids would LOVE the Exile series I am certain! I love that there's a music component to it as well. We always have music playing in class, from the Star Wars soundtrack to Seth Macfarlane's Christmas album. Having a story that actually goes with the music would be really amp up our classroom. (No pun intended.) And because the majority of my students only know rap and One Direction, I am always bringing in different genres to expand their horizons. My kids, well my students I use the terms interchangeably, are amazing. In November I tried to teach them not only the power of words, but how writing is a viable occupation, as we participated in NANOWRIMO. Their assignment was to write 2,500 words to contribute to our class novel. Many not only exceeded that, but one student in particular CRUSHED it and wrote over 11,000 words, and is still writing! My kids respond to the written word, sadly in one of the poorest districts in RI, they don't have the resources for new books. It would be an honor to have a set of your books in our room. Hi Shannon. I just posted a video on Facebook and you're a contest winner! Please either contact me by email (on my contact page), or on Facebook, or give me an email and we'll connect about where to send the books and how to sign them. THANKS! Hi Sydney! You won books! Please contact me by email (on the contact page) or on Facebook so I can get a mailing address and how you want the books signed. Thank you! I am a library media specialist and I would love to add ANY set to our library, especially set 4. I would love to win set-1 for my son's school, he is just getting back into reading (was too cool to read in middle school) and I think a rock and roll themed series might be just the ticket! I think his friends would enjoy them too! My kids are avid readers. They'd enjoy Set 4: The OLIVER NOCTURNE series and THE FELLOWSHIP FOR ALIEN DETECTION: Middle grade supernatural and science fiction! Perfect for grades 4-8, and would pass them on to their Issaquah Valley Elementary teachers after. I'm a teacher at an urban school with a limited library budget. I would love Set 4: The OLIVER NOCTURNE series and THE FELLOWSHIP FOR ALIEN DETECTION: Middle grade supernatural and science fiction! Perfect for grades 4-8, to add to our library. please! Hey everyone! The day 1-4 winners from this blog are Shannon McCloud, Off2Europe2005, Jennifer Fountain, Kristina Schmidt, and Gailmac66. Please drop me a line on Facebook or at the email on my contact page so I can send your books! Set #4 would be perfect for me. I am a 4th grade ELA/Social Studies teacher that have several students that love to read. Adding exciting books to our classroom library will just enhance their love of reading. Any set would be great to have. I am the librarian in a middle school library and unfortunately we do not have any funds to purchase books, so I am trying to find ways to get books into the hands of our students. I would love to win set 2. I teach 7th grade language arts at Killough Middle School in Alief ISD in Houston, TX! I'm a student teacher, one semester away from becoming an ELA/Reading middle grades teacher! I would absolutely love set 3 for my future classroom. I've been doing my best to build my classroom library when I come across books in thrifts stores, but these would be amazing to add to my small pile! 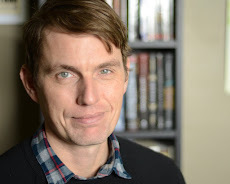 Hi there...my son's the grade humanities teacher from last year would love Book Set 3. I helped raise funds for her book clubs last year...her goal was to focus on reluctant readers...this set would be perfect. Thank you.